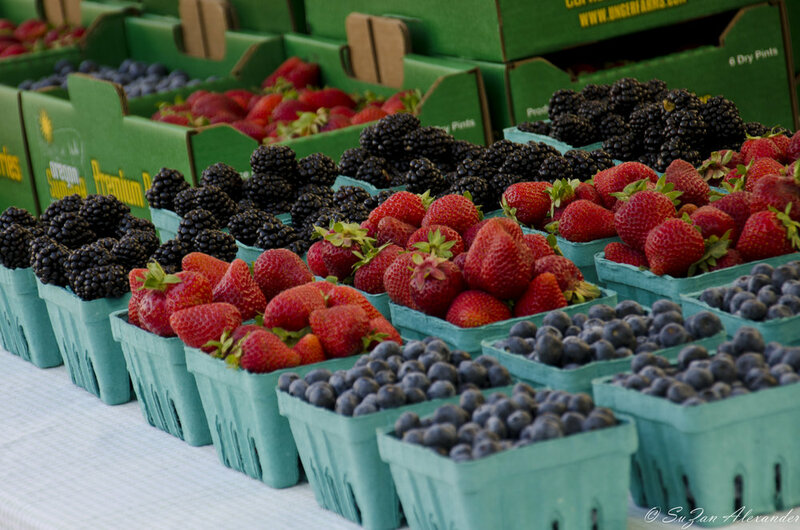 Farmers Markets are plentiful in Portland. I went to a couple while I was there. I happened upon the Pioneer Courthouse Square Market on Monday morning when it was a hub of activity, sights and smells getting set-up for the morning. What beautiful produce, cut flowers, baked goods, and products on display. They couldn't sell until 10:00 a.m., so I did a few tours and came back. Boy, am I glad I returned. I bought two delicious little confections from Two Tarts Bakery to enjoy as dessert that evening. The cookies were blueberry basil, and can I say; YUMMY! What an interesting taste combination. It was like a summer party for your taste buds. I also visited a lavender vendor, Dancing Light Ranch. Isn't that a great name? It is a small family-run lavender farm located in Corbett, Oregon. Those of you who know me, know I have a lavender addiction. I could have probably put a child through college, and perhaps even graduate school, with what I've spent on lavender plants, seminars, soaps, and the like. Anyway, the products were lovely and got my lavender seal of approval. (I'm sure they'd be relieved to know this.) I bought a jar of their Lavender Salve and my skin is enjoying a special treat. If our mode of transportation had been anything other than commercial airplane, I would have been loaded down with flowers and produce, because I would not have been able to contain myself. It's all good though, because I snapped a few photos to shore up my memory, and, if I'm lucky enough to return to Portland, I already know what I'll be doing on Monday morning.